We were lucky enough to be chosen to review the new Fisher Price High Chair, I decided that to give our families best opinion I would make the review 3 part over 3 posts. Part 1 – Description of Highchair, Ease of Assemble and initial views. – Found Here. So here is Part 2 – Grayson’s Use. Fisher Price designed the highchair with the following quote…. So I knew Grayson would be able to put this to the test, as many of you may know, Grayson is 2 1/2yo but mainly eats like a 6mth old, a diet of baby purees but is also now feeding himself Wotsits (which is very messy). Due to his disabilities Grayson has not been able to sit until recently in standard highchairs (this also is only for short meals) and has a disabled highchair. So I thought this would be very interesting to see how he and the chair coped. First impressions Grayson sat in it lovely, much better than other standard highchairs he has used out and about, I think this was helped by the cocooning seat and the plastic mould that comes up between the legs, this really helped him to stay in the correct position, which I think would be great for 6mth old that are just getting the hang of sitting a little. Grayson like a lot of special needs children has a tendency to head bang, this chair was fab for that, I had no concerns he could hurt himself, the cushion is padded and comes high up the back and even with him jumping around to his full extent, the large footprint of the legs meant the seat barely budged, so even at his size I felt the chair would not go over. The height adjustment, not only was it easy to do, but it allows Ashley and I to feed at different heights as we sit at different heights and also meant the chair could be adjusted to sit at the table with us. Seat Cushion – As promised even with Grayson dropping wotsits all over it, spitting his orange purees against it, it wiped clean with just a simple baby wipe, I agree there are very little crevices for the crumbs to fall into, but even when they did the seat cover can be taken on and off in a matter of a minute so lovely to keep clean. We liked the tray size and the deep lip, this meant when Grayson was feeding himself he couldn’t just push everything of the tray as he can sometimes struggle to grip food. We liked the wheels on the front of the highchair as it made it easy to move around our Kitchen/Diner. Tray – We loved the one button that allowed the tray to be put on and off, it meant this could be preformed with one hand whilst you safely hold the baby in your other. So all in all the chair worked well for Grayson use. 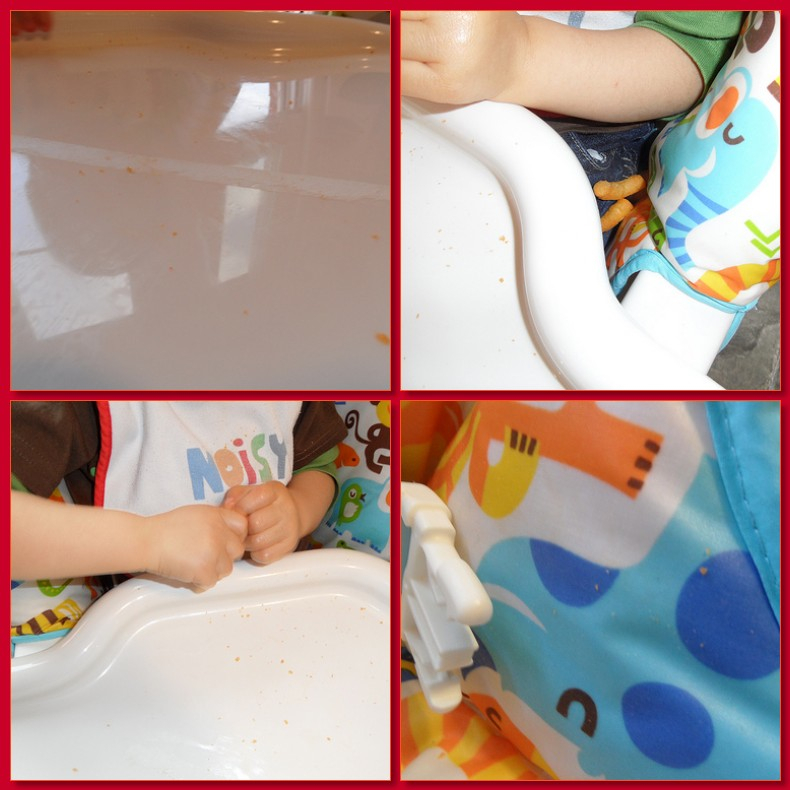 We only had 2 issues with the highchair, firstly as you can see from the picture we found the tray too big to fit in our dishwasher (which is standard size) I honestly must say this did not change my opinion that I would buy the highchair as the tray was so easy to just wipe clean even when covered in Wotsits/Juice and Puree mix. Our 2nd issue, which could be a deal breaker for some, is the collapsing of the legs, as I said before the chair has a large footprint, if unlike us you do not really have a designated area for the highchair to stay up this could be a slight issue, I am 5ft2in and Ashley is 6ft2in and neither of us found it easy to collapse the chair single handily. But again in our current home this would not bother us. I hope you have found the review helpful, if you would like to know anymore on the highchair from us or Fisher Price please feel free to contact me. 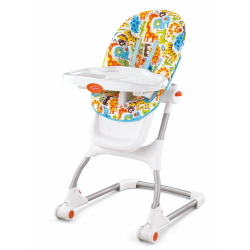 Disclosure – We were sent this highchair from Fisher Price Free of Charge for our families views on the product.